I have been a Marketing professional for over 5 years before I had baby. So, I know what it means to be a working individual as well as a Stay-at-Home-Mom (since I am one now). There are several misconceptions or assumptions about Stay-at-Home-Moms, which may be funny or irritating depending on your mood. Let me clear out a few at least. Time: Just because we are at home 24 X 7 does not mean we have all the time in the world because no matter what you believe we don’t ‘do nothing’. The first thing people say when they call up or drop in during afternoon is ‘were you sleeping?’ Just because I stay at home the whole day does not mean I have the luxury of sleeping whenever I fancy. In fact, I never sleep, except at night. Since I am the primary care-giver of my child and we do not have any other family member around, the only free time I have is when my son naps. So I don’t waste a single minute of that time in napping or whiling away. I straightaway get down to finishing my work. Money: People generally assume that the reason we are not hiring a nanny to take care of our child is because we don’t have enough money (since I am not working any more). Trust me, it is by choice. I have help for cooking and cleaning but I wanted to take care of my child myself – cooking for him, giving him massage/bath, feeding, putting to sleep, etc. Of course, I regret it sometimes because of how overwhelming it gets, but still when I see the larger picture, I love it. Watching TV: None of my friends believe that I don’t watch TV. Of course, the question that they don’t say out loud is ‘what do I do the whole day?’ Well, I haven’t decided to stay home to watch TV! On a serious note, I don’t have time. Most of the time I am pursuing my son’s routine, in whatever time is left, I read and write. Moreover, the impact of TV is same on adults as on kids. It almost hypnotizes you and slows down your reaction. I have a toddler at home. His curiosity leads him to dangerous stunts sometimes. If I am not mindful and alert at all times, he could hurt himself. Moreover, I am careful of not exposing him to unsuitable TV programs. Relaxation: Agreed, I don’t have to rush to office at a particular time, but the moment my day starts, the whole day revolves around my child. As soon as I wake up, he starts following me. I brush his teeth, try to potty train him, feed him his breakfast and only then have mine, play with him because he wants Momma to sit with him and play, get the helps finish their work, put the house in order, massage him, bathe him, feed him fruits, put him to sleep, and then I get some breathing space. Relaxation? I haven’t read newspaper properly for so long now. 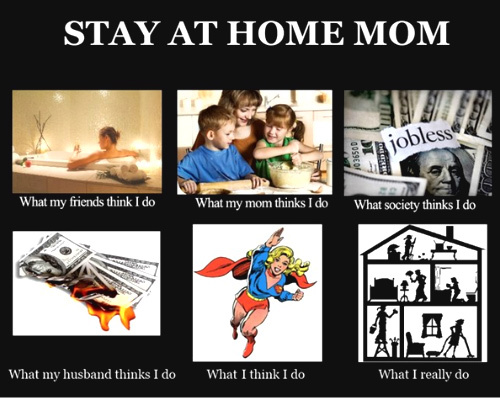 Personally, more than annoyed, I am amused by the perceptions about Stay-at-Home-Moms. Do you have anything to add or may be a counter-point? Honestly, I don’t mind! Education Should Enrich Children, Not Burden Them!